Nail fungus also called onychomycosis is a very common condition, which occurs either in toenails or fingernails. This condition begins as a yellow or white spot under the tip of the toes or fingernails. When you have acrylic or artificial nails, the nail fungus can also occur. If left untreated, the nail fungus will lead to loss of nails and foul-smelling odor. So, how to get rid of the nail fungus quickly and effectively? Do not worry because it can be treated inexpensively. 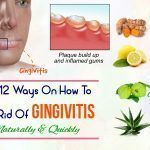 In this post on Beauty Talk, you will find out 32 proven home remedies for nail fungus on toes, fingers, and from acrylic nails, along with its causes, symptoms, prevention and much more. 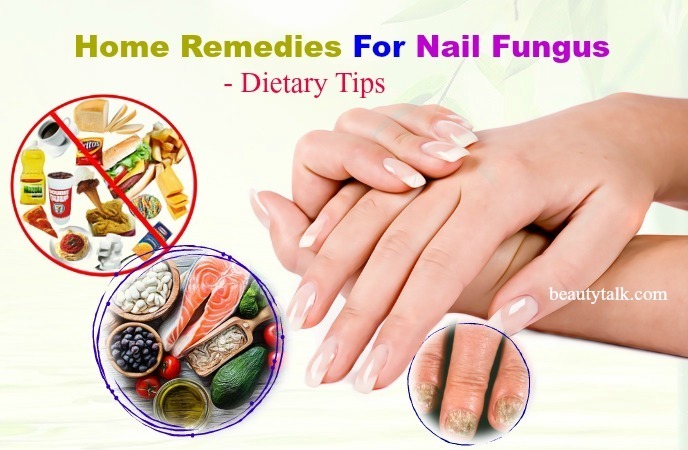 Nail fungus are caused due to various fungal organisms. A type of fungus named dermatophyte is the most common cause. This problem also develops when fungus or mold grows quickly under the nails, which leads to distorted or discolored nails. Using unsanitized nail tools in the spa and overexposure to dark or moist environments also cause a nail fungus. Other factors such as a weakened immunity and poor blood circulation to the feet also lead to this problem. Below are factors that can increase the risk of developing a nail fungus. 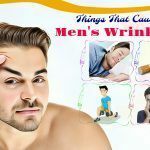 Being older due to reduced blood flow, slower growing nails and more years of fungal exposure. 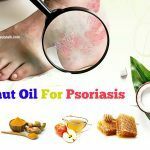 Having a skin issue such as psoriasis or a nail injury. Having a weakened immunity, diabetes, or circulation problems. Wearing barefoot in moist communal places such as gyms, shower rooms and swimming pools. Having a family history of athlete's foot. Listed are the different remedies with a specified description. 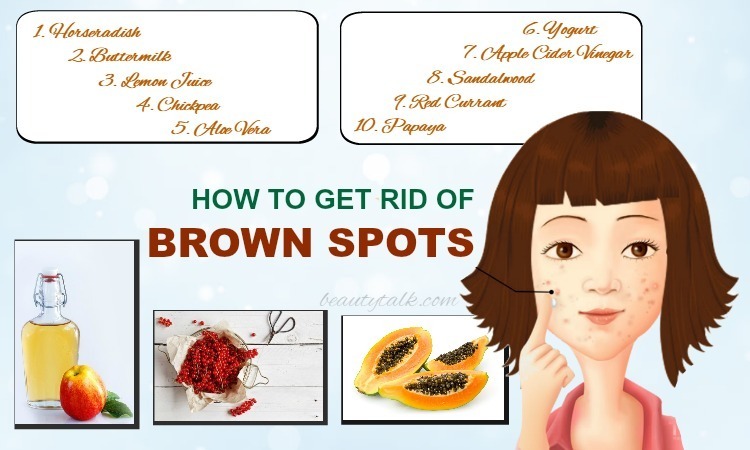 You scan try any of these methods and continue using regularly until you obtain the desired result. These home remedies work effectively for both toenail and fingernail fungus. 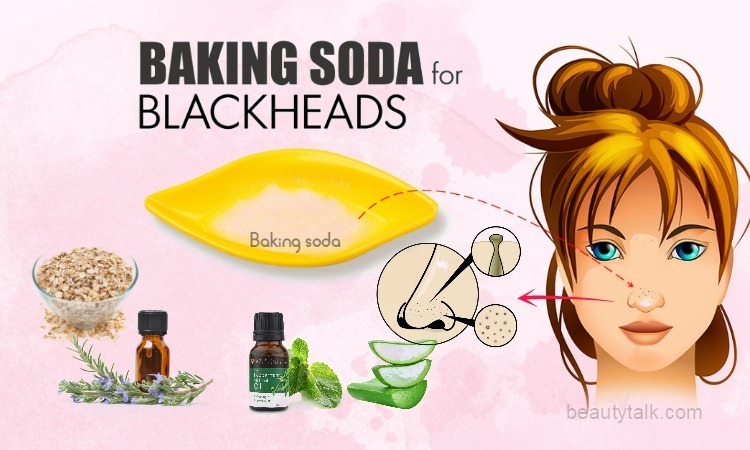 Mix the baking soda and water well to have a paste. Spread this paste over your affected areas with a cotton swab. After that, scrub your nail with the help of a toothbrush and wait for around 15 minutes before rinsing with lukewarm water. Finally, pat your nails dry. Combine all the above elements and stir well. Apply this paste on the infected nails and rinse it after fifteen minutes with lukewarm water. After that, pat the nails dry. Mix the ACV and a cup of water in one bowl at first and later soak your infected nails in this mixture for around 15 minutes. Then, remove the nails and pat them dry. Afterward, prepare a bowl with the baking soda and one cup of water and mix well. Soak your nails into this resultant solution for another fifteen minutes. Finally, remove and pat your nails dry. You can use any of these remedies twice a day until the condition is gone. Just mix equal parts of ACV and warm water. Then, soak your fingers or toes in the mixture for thirty minutes and after that, dry your nails completely. For quick relief, repeat the process two-three times per week. Drinking ACV is another way to murder the internal bacteria and fungus. Regular intake of ACV will assist in strengthening the immunity which copes with this problem from inside. All you need to do is adding a tbsp of ACV to eight ounce of water. Then, consume it thrice in a day. Alternatively, you can take its pill form. Pour the ACV directly on your infected toes or fingers. Allow it to stay for a couple of minutes before disturbing it. It’s best to follow the treatment thrice a day until the infection completely clears. Combine the ACV and Listerine in equal quantities and apply the combination on your nails. After around 30 minutes, rinse the nails. Try this remedy a few times daily for visible results. 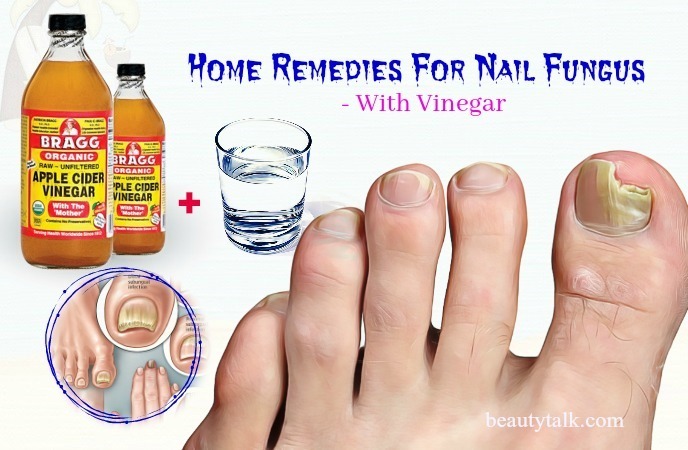 If you are seeking for the natural home remedies for nail fungus on both toes and fingers, then try a vinegar remedy. Thanks to its antifungal properties, vinegar is perfect for killing the fungus. 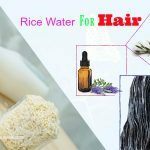 Plus, it also possesses the acidic nature, which helps balance the pH levels of the skin and nails to prevent the growth of fungus. It further relieves itching and boosts the healing process. Take a big bowl and mix the ACV and warm water in the ration 1: 2 in it. Then, soak the infected fingers or toes in the mixture for 15 to 20 minutes. Afterward, remove your fingers or toenails from this mixture and rinse them by using clean water. Use a hair dryer or towel to dry your nails completely. Follow the cure twice per day until you attain the results. Get one large bowl and add an equal amount of vinegar and Listerine. Soak your nails in it for 15 – 20 minutes and afterward, remove them from this solution. Gently scrub your nails with a soft-bristled toothbrush to fade away the dead skin cells. Follow the treatment twice in a day. Listerine in this remedy has antiseptic, non-steroidal anti-inflammatory and analgesic properties, which all are effective for treating a nail fungus. Get enough water to soak the nails and later boil the water. Remove from the flame and allow the temperature of water to decrease till your skin tolerates it. Now place your fingers and toes in this water. The, pour some Epsom salt on your infected nails and leave them to be fully surrounded by the Epsom salt. Soak for 15 to 20 minutes before rinsing with water and pat them dry. For best results, do the process 3 times per day. At first, add the Epsom salt to the water and mix them well until the salt gets dissolved. Then, add the tea tree oil to the solution and leave your nails to soak for 20 minutes in the solution. Lastly, dry them completely. You can use this simple remedy twice a day. Use lukewarm water to rinse your nails. Add several drops of hydrogen peroxide on one cotton pad and place it directly on your infected finger and toenails. Wait for 5 minutes and then dry your nails with another cotton pad. 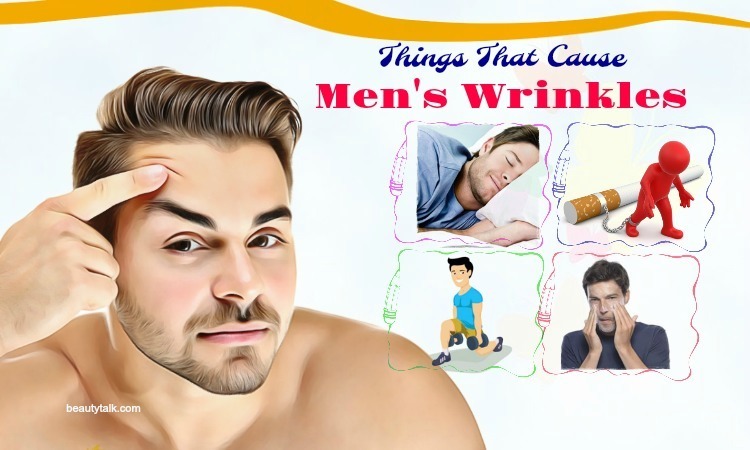 You can do the procedure 3 – 5 times a day. Mix a part each of water and hydrogen peroxide. Next, you soak your infected nails for fifteen minutes in this solution. After that, remove your nails from this solution and allow them to dry. To see the improvement, repeat the process every day before sleeping for about six weeks. Just combine equal parts of the vinegar, distilled water and hydrogen peroxide in a plastic tub. Soak the infected toes and fingernails in this resulting solution and after 10 minutes, use a dry tissue to dry your nails. Repeat this simple way daily. Mix the above components in a plastic tub and soak your nails in this mixture for ten minutes. Then, dry your nails by using a dry tissue. For significant results, repeat this process daily. Take some coconut oil and spread a thin layer of the oil on your affected nails while massaging gently for several minutes. Leave the application all on for a few minutes. Repeat the process around 3 – 6 times daily. Firstly, wash the affected area. Later, mix the coconut oil and oregano oil well. Start applying a small quantity of the solution evenly on your infected nails and gently massage for a couple of minutes. Allow it to dry on its own and soak to remove the fungus. You can use this treatment twice per day for a minimum of two weeks. Note: Don’t use undiluted oregano oil. Mix the coconut oil and clove oil at first and apply this oil mixture directly on your affected areas afterward. Let it sit for several minutes before washing it. Repeat this application frequently 2 – 3 times per day. 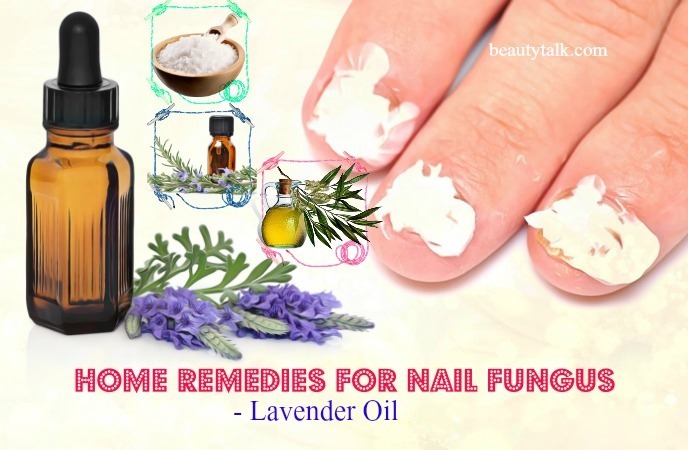 The antifungal agents present in lavender oil are useful to treat mild causes of nail fungus. It further protects your nails from moisture by creating a protective layer to them. Apart from that, it also helps to make the skin around your nails shiny and healthy. 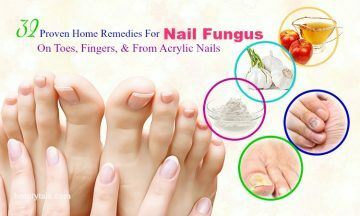 Thus, you shouldn’t ignore this wonderful remedy when looking for the effective home remedies for nail fungus on toes and fingers. The first step is filling one basin with lukewarm water and adding the Epsom salt and lavender oil to it. The follow step is stirring well with the help of your hands until the salt gets dissolved. Afterward, soak your nails in this solution for about 20 minutes. Lastly, rinse off using water and pat dry. Combine all the elements and mix well. Pour the solution into an airtight container. Then, dust enough quantities of the mixture on your infected nails. After that, wash it off after a couple of minutes. Repeat this application every day before wearing socks. Just mix the lavender oil and rosemary oil in equal amounts. With the aid of a cotton ball, apply this mixture on your infected toes and fingernails. Let it dry completely and rinse with water. Follow the process 2 to 3 times a day. Rosemary oil deals with nail fungus efficiently and keeps the skin around your nails healthy. 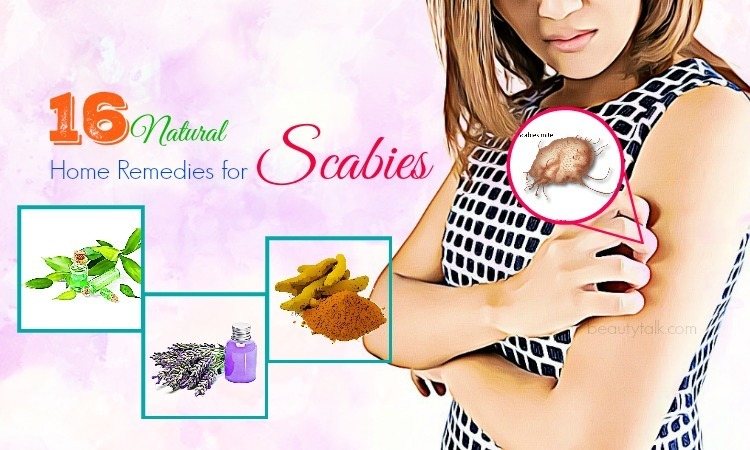 Because it embraces antiparasitic, antiseptic, antibacterial, analgesic and antifungal effects, Oregano oil works as one of the amazing home remedies for nail fungus on fingers and toes. When taken internally, this oil can battle the candida virus within your body. Get several drops of oregano oil and lightly rub it over your affected nails. Let it dry completely. You should repeat this application 2 – 3 times per day for quick relief. You can also dilute oregano oil with fruit juice or water. Consume few drops of this drink. Alternatively, you can take this oil in the form of supplements. Dilute the oregano oil into the olive oil and apply it on the affected part of your nail. Rinse off with water after thirty minutes and pat dry completely. Follow the process twice per day. Honey is highly beneficial for treating skin wounds and infections. It is also one of the most excellent home remedies for nail fungus on toes and fingers. Honey helps to heal toenail fungus by removing the toxins from the foot, as it is antifungal. Not only that, it consists of hydrogen peroxide that is good for killing bacteria and healing burns. Take a tiny amount of honey and pour it on your affected nails. Then, wrap it with gauze and remove the gauze after several hours and rinse with water. After that, pat dry completely. For the desired results, repeat the process twice in a day. You can mix a tablespoon each of honey and apple cider vinegar and consume it daily for treating this problem internally. Like tea tree oil, cornmeal contains natural anti-fungal properties. It has been used to eliminate unwanted fungus on lawns and flowerbeds by gardeners. It is also effective in fighting the nail fungus. It penetrates the nails and kills off the fungus directly, allowing fresh, uninfected nails to naturally grow. Along with that, it can alleviate the discomfort and pain of nail fungus. Firstly, take one bowl enough to soak the fingers or toes. Then, add the cornmeal and water to it and keep aside this mixture for an hour. After that, soak your infected nails in it for a minimum of 30 minutes. Lastly, rinse using water and pat dry. Follow the process regularly. Get a little fresh lemon juice and apply it on your infected nails. Rinse it off after thirty minutes with warm water. Mix the olive oil and lemon juice in equal amounts. Next, massage the infected area with the mixture and then, rinse it off after a few hours. Use either of these methods a few times every day for one month or longer to achieve positive results. 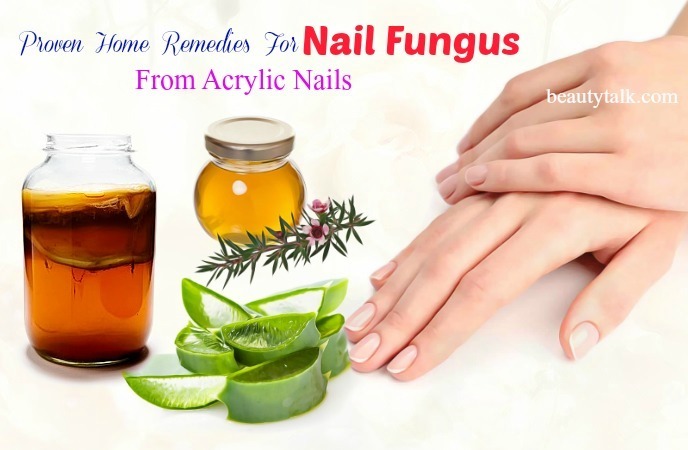 Below are various home remedies for nail fungus from acrylic nails. Let’s check out. 1. Tea Tree Oil: This oil is one of the perfect home remedies for nail fungus from acrylic nails thanks to its antifungal and antibacterial abilities. A 2003 study showed that tea tree oil worked well on decreasing the growth of the fungus T. rubrum in the nail infections. Add some tea tree oil to any carrier oil of your choice. Then, apply it on the affected area with a cotton swab for several minutes. 2. Aloe Vera: It has antibacterial and antifungal properties, which help inhibit the nail fungus and promote the healing of the nails. Get some aloe vera gel and soak one cotton ball in it. Then, apply on your affected areas before your bedtime. Then, wrap the applied area in one plastic bag and keep it overnight. Wash it off the next day. Follow the process for more than one week. 3. Use Kombucha: It works as one of the best home remedies for nail fungus from acrylic nails. For this treatment, use the fermented tea and rub it into your nail before hitting the bed. Follow this remedy on a daily basis. 4. Garlic: It contains some antimicrobial and antifungal capabilities, which make it one of the ideal home remedies for nail fungus from acrylic nails. For this remedy, place crushed or chopped garlic cloves on your fingers or toenails for thirty minutes every day. Alternatively, you can use garlic capsules to treat the nail fungus form the inside. Generally speaking, diet plays a vital role in managing the presence of fungus and bacteria in the body. Some foods can help curb its activities while a few foods can make it grow rapidly. Seaweed: This food can help the body kill the candida, cleanse the intestinal tract, and eliminate toxic pollutants, heavy metals. The presence of iodine in it aids in balancing the thyroid gland. Olive Leaf Extract: It is helpful for killing any virus, fungus, bacteria and protozoa. It also works wonders in murdering the fungus and cleansing and detoxifying your body. Probiotics: A flora imbalance can cause fungal overgrowth. Thankfully, probiotics can help to balance the flora. Kefir, miso, tempeh, sauerkraut and Greek yogurt are some of the methods to incorporate probiotics into the diet. Antifungal Foods: Onion, garlic, carrots, raw honey and coconut oil are some of the top foods that contain antifungal properties. So, include these foods in your diet. You can either add the antifungal foods to the daily food or eat them directly. Gluten: Fungus feeds on gluten that is present in wheat products. Thus, lower the quantities of gluten in your daily diet. Sugar: Fungus lives and grows on feeding sugars. Therefore, cutting back the consumption of sugar can kill off the fungus. Trim nails straight across, use a file to smooth the edges and file down thickened regions. After each use, you should disinfect your nail clippers. To reduce the risk of developing nail infection, maintain hygiene and keep your nails short, trimmed and clean. Regularly wash your feet and hands. After touching the infected nails, wash your hand. After washing, moisturize your nails. Give up artificial nails along with nail polish. Wear footwear in locker rooms and pool areas. Discard old shoes or use disinfectants or antifungal powders to treat them. Change your socks during the day or wear sweat-absorbing socks. 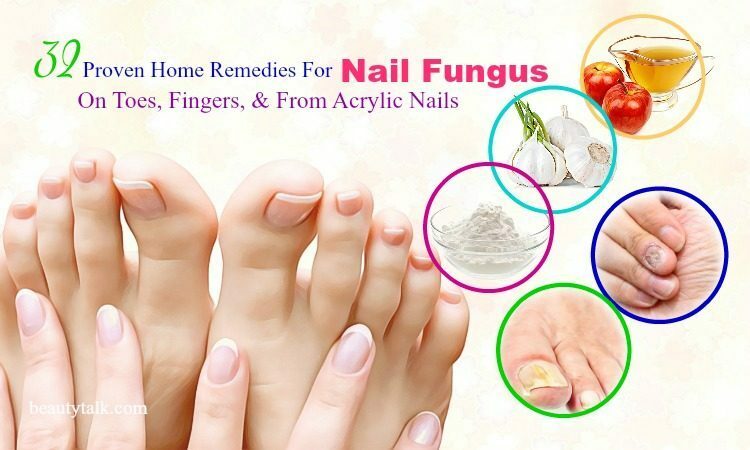 If you are suffering from nail fungus problem, you should try these natural treatments. With natural cures, you gain chemical-free, safe cures and save a lot of money. 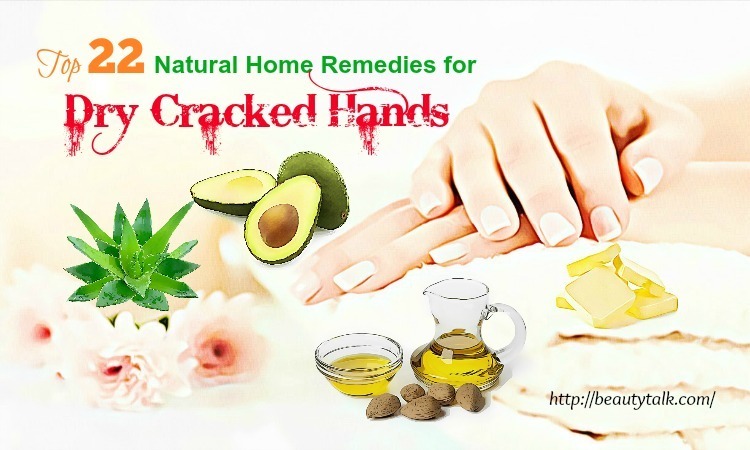 If these home remedies have not helped and your nails become increasingly discolored, deformed or thickened, consult a doctor immediately. Do you know other home remedies for nail fungus on toes, fingers, & from acrylic nails? Please, share with other readers and us. All of the contents provided in this article are for informational and educational purposes. We recommend you consult a healthcare professional to determine which method is appropriate for you.